We’ve been back at our mooring for over a week now having hopped back down from Cropredy and moored in Banbury Castle Quays (town centre) for a couple of nights to get our post, some shopping and for Joy to return to her art class although she has been doing ‘distance learning’ by following their projects from photos her tutor has been sending her. 663 miles, 206 yards and 292 locks. 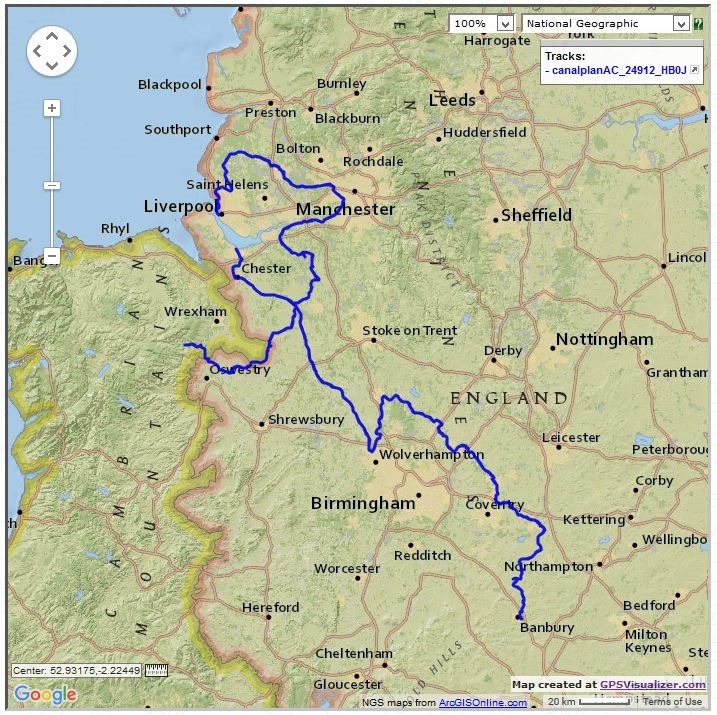 GPS Visualizer created this map of our meanderings. Since returning we have retrieved our car from it’s temporary home and and got it through a MoT with help from my ex-colleagues at the college. 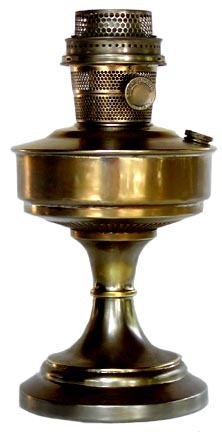 Having got the car back on the road, on Saturday we visited Finmere Car Boot Sale, where I was almost tempted to buy an Aladdin Lamp but a new glass chimney and mantle would have increased the cost at least seven-fold! From there we went on to visit my sister, Jan in Rushden to bore her with our holiday snaps! On Sunday we went to Heyford Park Chapel where we received a warm welcome from our friends after being absent for so long and afterwards we de-camped to Heyford Wharf where we met lots more friends from my Oxfordshire Narrowboats days including Annie & Tim who are now back ‘down south’ running Kizzie’s Bistro where we enjoyed a light lunch with our friends Ruth & Barry who also happened to be there. As we were enjoying our food the Good Ship Bones appeared beside us in the winding hole and we exchanged greetings before she headed back off in the opposite direction with promises to catch up properly soon. Yesterday was Joy’s birthday so we spent the day in Gloucestershire meeting friends at the Berry Blue Café in Cam and finished the day with a meal at The Hawbridge Inn beside the Severn near Tirley with our son Jeremy. 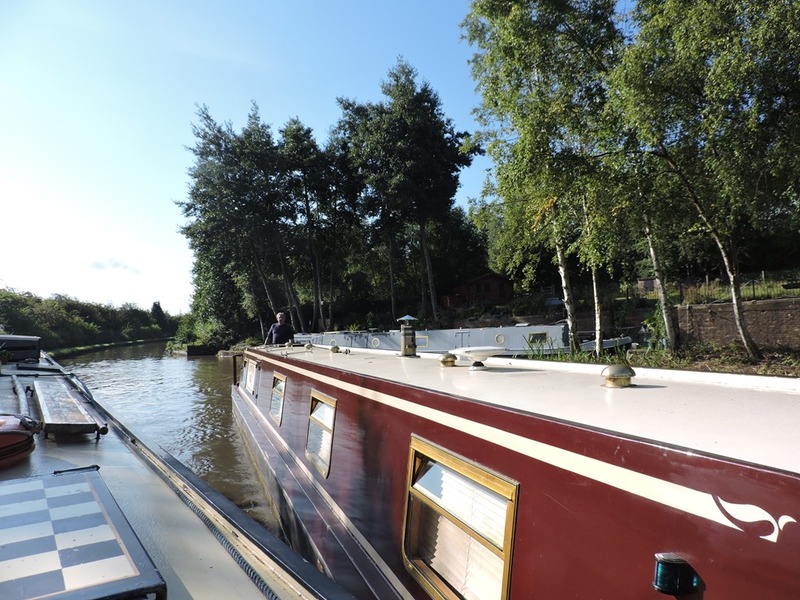 As intimated in our last blog we have stayed in Fenny Compton for a few days, on Friday evening we were joined by Ruth and Barry from Heyford for an evening meal at The Wharf Inn and subjected them to a viewing on some of our 2000 plus photos over coffee back on the boat. On Saturday afternoon our friend Allison joined us for the weekend and on Sunday we spent the day at Stoke Bruerne Village at War, we always enjoy this event and gives everyone an excuse to dress up in 40s style. We were fortunate to see and hear a Spitfire fly overhead and see the displays of historic boats and militaria. Monday morning was chill out time and after lunch Allison drove us into Banbury and while the girls hit the charity shops I collected the post and got a passport photo done for my passport renewal. 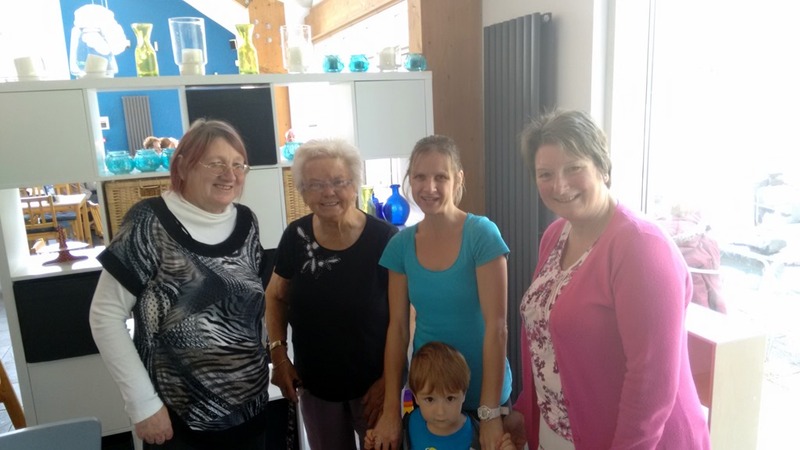 We said our goodbyes to Allison after tea & cake at The Whistling Kettle and then caught the bus back to Fenny. Today we have reversed back to the waterpoint and joined the queue to top up. For anyone passing that way, beware of a hole beside the piling at the end of the waterpoint moorings, just right to break an ankle if you catch your foot in it. I have emailed C&RT to advise them of the danger. 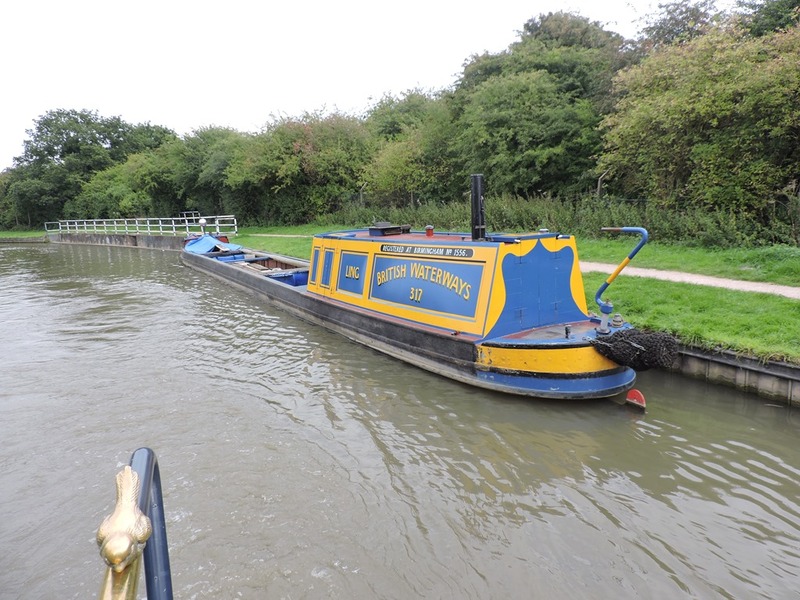 We eventually got away at 10 to 11 and travelled south through Fenny Compton ‘Tunnel’, Claydon, Elkington`s, Varney`s & Broadmoor Locks, nine in all. The rain caught us out at Varney’s Lock then it stopped for a while until we moored up at Cropredy when it poured down again.. ..
.. and now the sun is out! Yesterday we spent the morning with culinary tasks, Joy made Scouse for tea and then we started converting our foraged damsons and apples into chutney, we were short of raisons and dark soft brown sugar so we made the short journey to the bottom of Napton Locks. On the way we took pictures of the windmill (again!) the one zoomed in makes the new house look as if it’s right next to the windmill while the other one shows it’s not! We moored above the first lock and walked up to the village shop for the necessary supplies. After lunch we left the chutney simmering while we continued up the locks to spend the night at Marston Doles. We enjoyed the Scouse and then put the chutney into jars before turning in. This morning we did a load of washing before leaving and attempted another load at our brunch stop near the famous radio mast but the generator ran out of petrol! 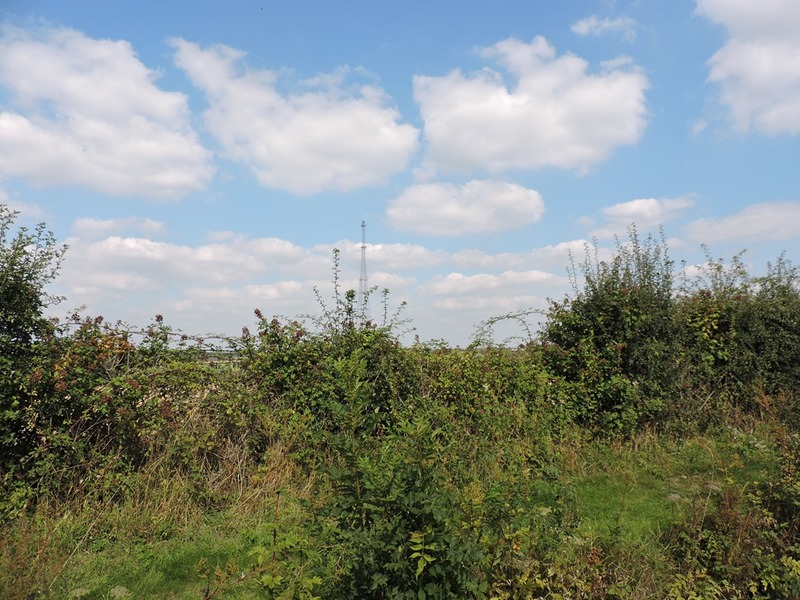 After lunch we continued on our circuitous way following the contours along the summit level and arrived in Fenny Compton about 2 pm and were fortunate to get the one available space which even more fortunately a 14 day mooring as we want to stay here for a few days. In the short time we’ve been moored up we’ve already seen friends, Brian on nb Harnser passed by and Jim from nb Smoking Badger walked past on his way back from the village. More visitors are expected over the coming days, we must be back on home turf (or is that water). Catty is well pleased too as she has been out exploring familiar haunts. This morning was a total difference to yesterday, damp and cold as we left, the rain never came to anything but the cool breeze continued all day. 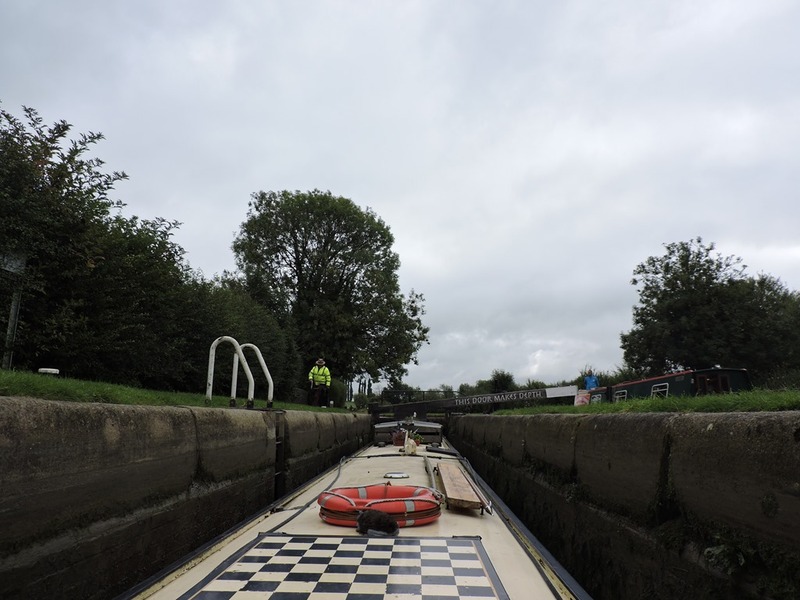 Our only locks today were at Hilmorton and we were assisted at the first pair by a Volunteer Lockkeeper, then we were on our own but met boats coming down the flight at every lock. It was on through the Barby Straight and 2½ hours later we were at Braunston, we watered up at the junction, then on through to Braunston Marina for a pump out, and moored just outside was Maffi’s boat, Milly M so we hijacked him for a pint at The Boathouse, it didn’t take much to persuade him! We enjoyed catching up on each others news and generally putting the world to rights and were surprised to find it was 4 o’clock when we emerged. 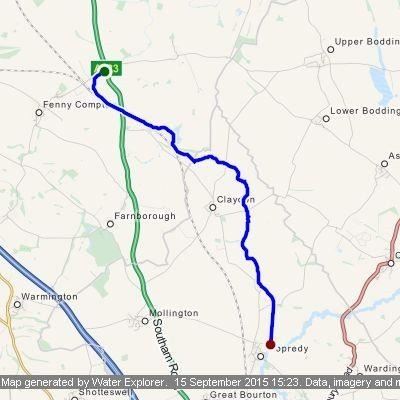 On we went and at 6 pm we squeezed into a mooring spot near Napton Bridge 111 with inches to spare. 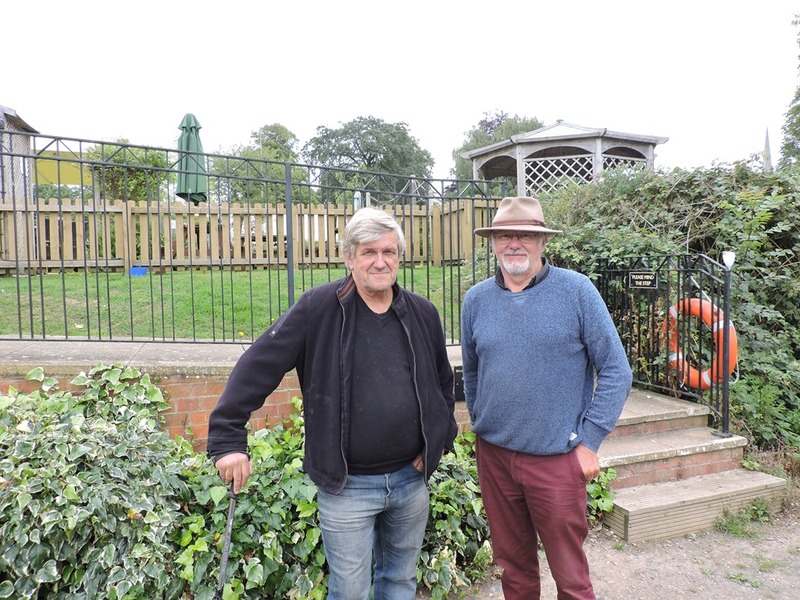 The volunteer lock keeper at Atherstone reminded us that Shackerstone Festival had been on this last weekend and this became clear as we met several of the participants and visitors as we left Hartshill this morning. At Wood Bridge we met our first of the historic boats, Kangaroo towing the butty Australia on a short line, we were able to pull onto Springwood Haven’s wharf and keep out of the way. 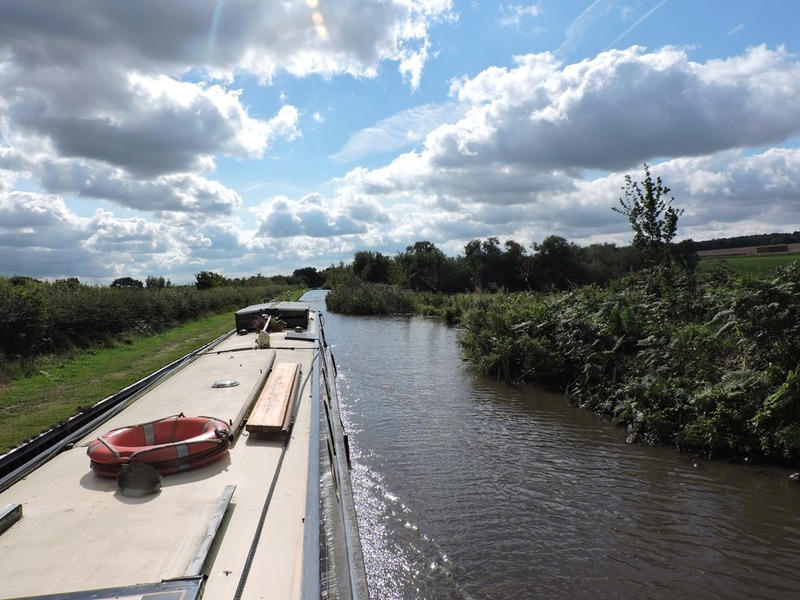 We continued to meet boats until we reached Marston Junction where The Ashby starts to make it’s way to the current terminus at Shackerstone. 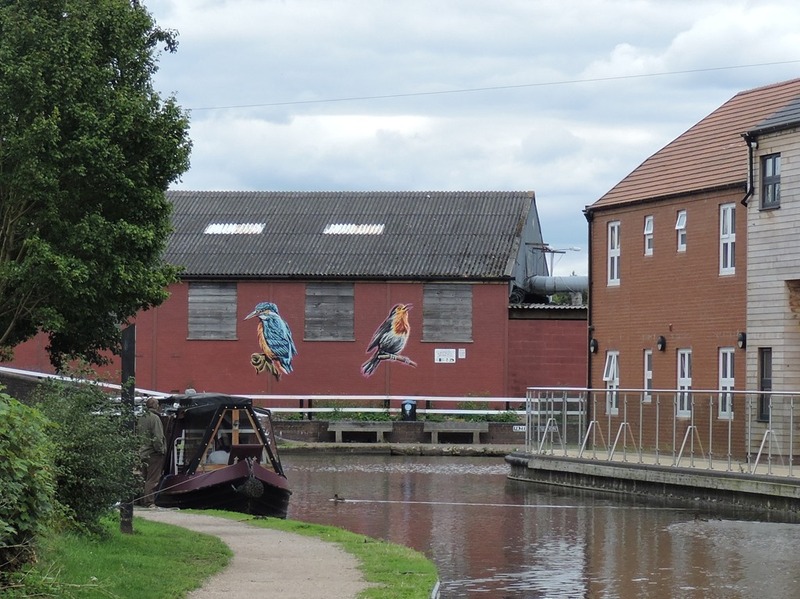 Our approach to Nuneaton was marked by an increase of rubbish in the canal even before we had reached any housing, it’s disappointing when a town seems to turn it’s back on the canal. 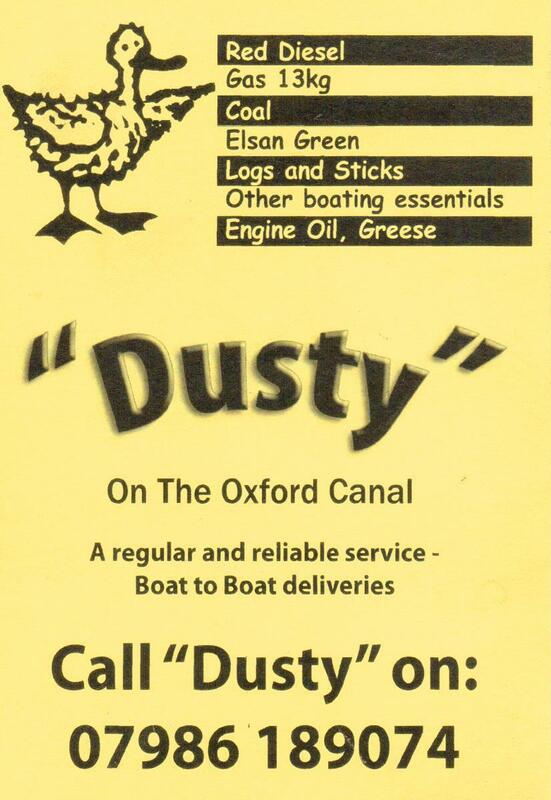 The only item of interest being Boot Wharf with it’s moorings and boatyard. 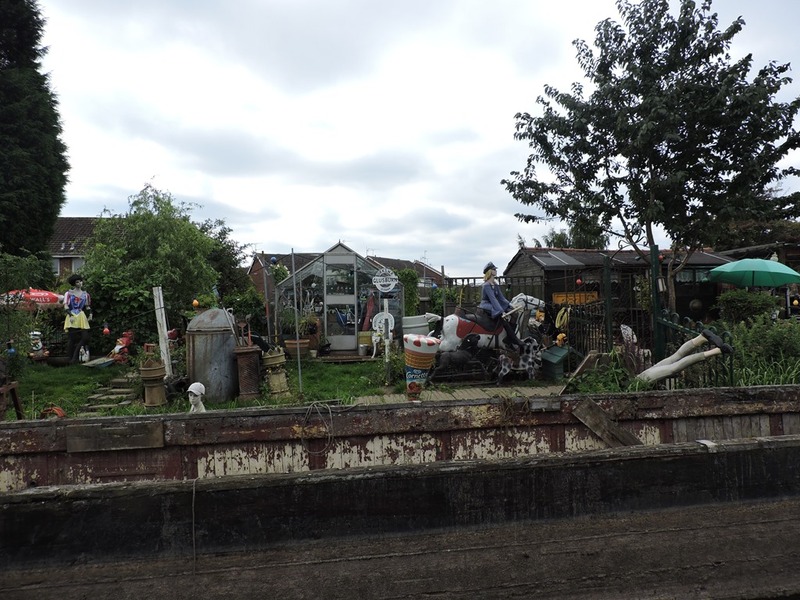 We were soon out of town and passing the quirky Charity Dock with The Stig & A Fine Lady on a White Horse in residence. 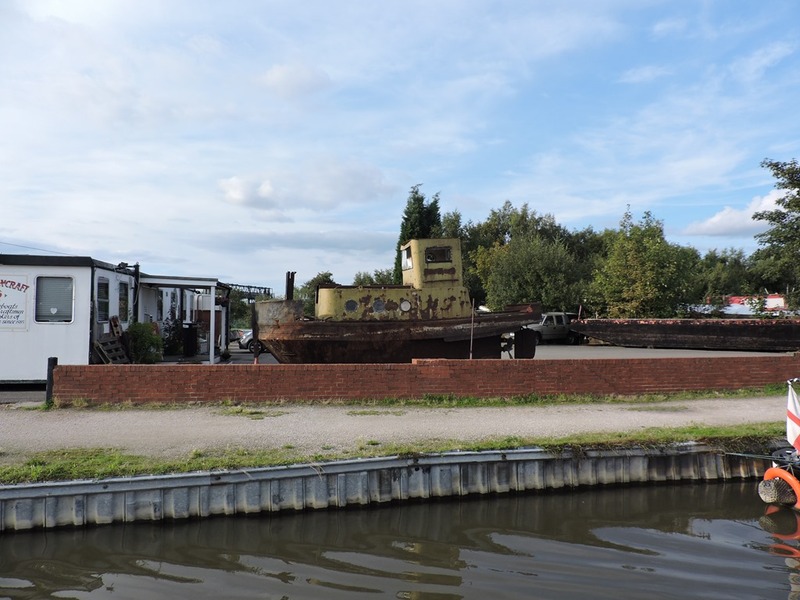 It was then on to Hawkesbury Junction with the 180 degree turn under the bridge and into the basin to queue for the lock, a boat was having issue with opening the lock gate but it was soon resolved and historic boat, Panther went on through, then it was our turn. 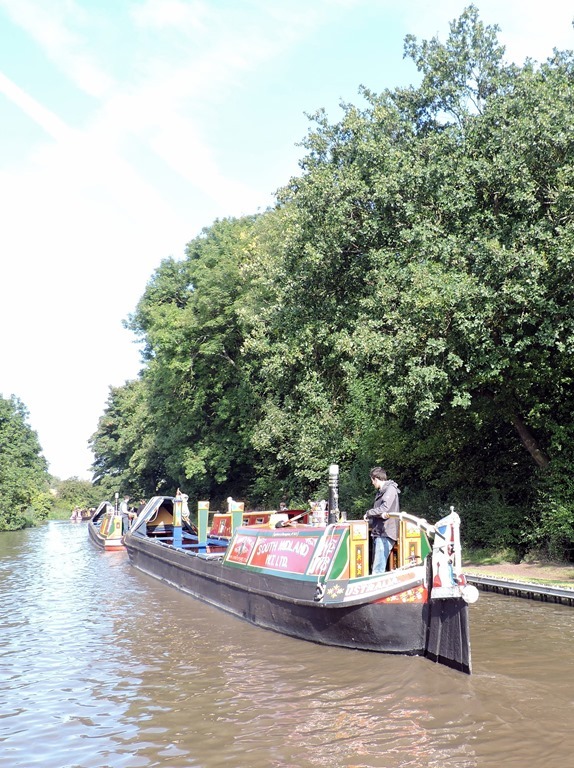 We had considered stopping at Ansty or Newbold but there were no moorings available at either, so as the weather was still glorious we kept going until we reached Rugby’s Visitor Moorings at Brownshill. 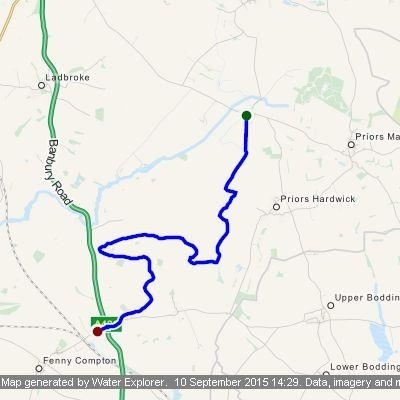 The longest day we have done for a long time, 21.48 miles, 8h7m, 1 Lock and 76 Bridges, then shopping at Tesco after tea… Phew. 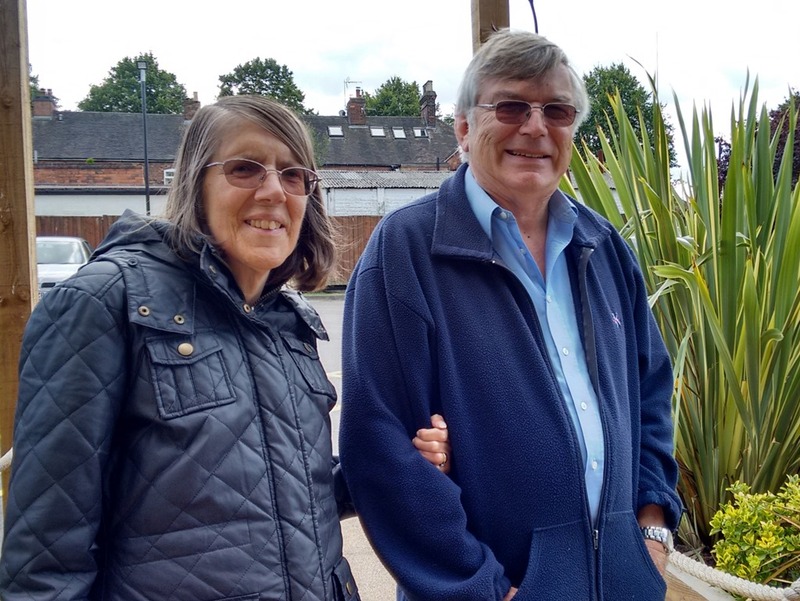 Our visitors, Carol & Ted, arrived at The Gate Inn in time for Elevenses and we chatted (and chatted) reminiscing about our 1988 canal holiday together, the route of which we have re-discovered over the past few weeks. Soon it was lunchtime and we enjoyed another meal in the pub, I tried their Beef Rendang which I really enjoyed, whilst the others played safe with plaice and chips, which was equally good. All too soon we had to say goodbye but not before more tea and snacks had been forced upon them. We don’t usually start our day’s journey at 5:30 pm but it was just a short hop down to Pooley Country Park to catch up with Ray & Penny (who painted the wrens on our back doors) naturally more tea and cake was consumed! On the way we passed Narrowcraft at Alvecote where this tug was up on the hard-standing. 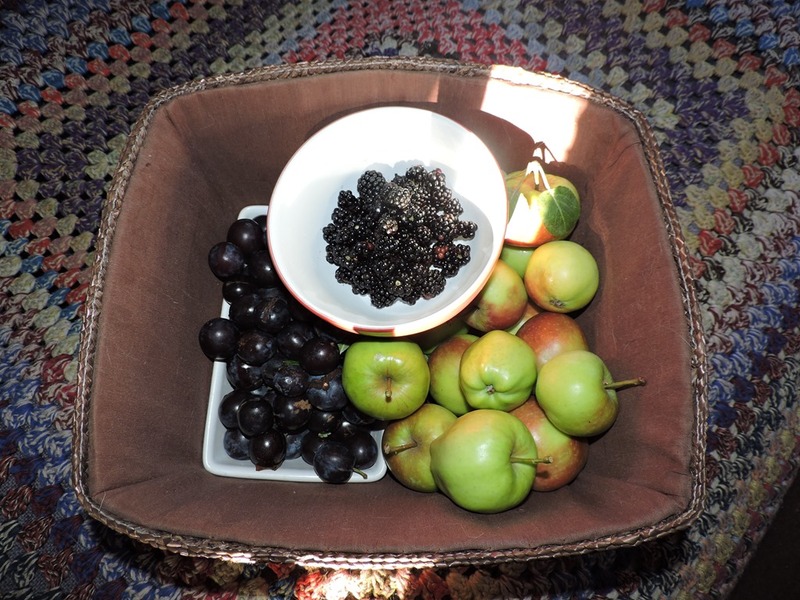 This morning Ray and Penny had to take their boat down to Fradley for blacking, but not before we had been shown where to find damsons, apples, blackberries and bay leaves around the park. We waved them off.. and they promptly got stuck on a mud bank coming off of their mooring! So a kind of push-me pull-you tow was in order, then we moored back up to continue our foraging before leaving. An hour and a half later, at 12 noon we were at the bottom of the eleven Atherstone Locks and did well with all but two of them in our favour. 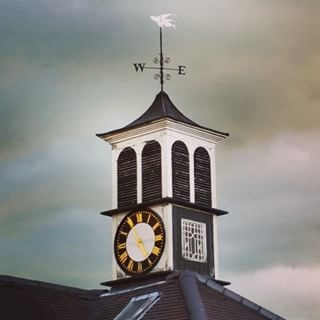 Penny had told us not to miss the Clock Tower Tea Rooms and Cookery School at Hartshill Yard so we moored up in a sunny spot nearby and visited it, sadly for us they had completely sold out of cake (!!!) so it was just a pot of proper leaf tea and a fruit juice. Penny has some of her art work on sale here so we purchased a couple of greeting cards. We thought we could indulge ourselves tomorrow for breakfast instead only to find that they don’t open on Mondays! Oh well, back to the boat to look forward to Joy’s cauliflower cheese & a fruit crumble instead. This morning’s start was delayed by a call from Karen, our daughter in Australia but we were still away by 9:00 in fine but cool, cloudy conditions, occasionally the sun appeared and made the water sparkle. First impressions were that this section of canal needed some TLC with bankside erosion almost reaching the towpath in spots and sightlines through the first two bridges badly obstructed by overgrown foliage. 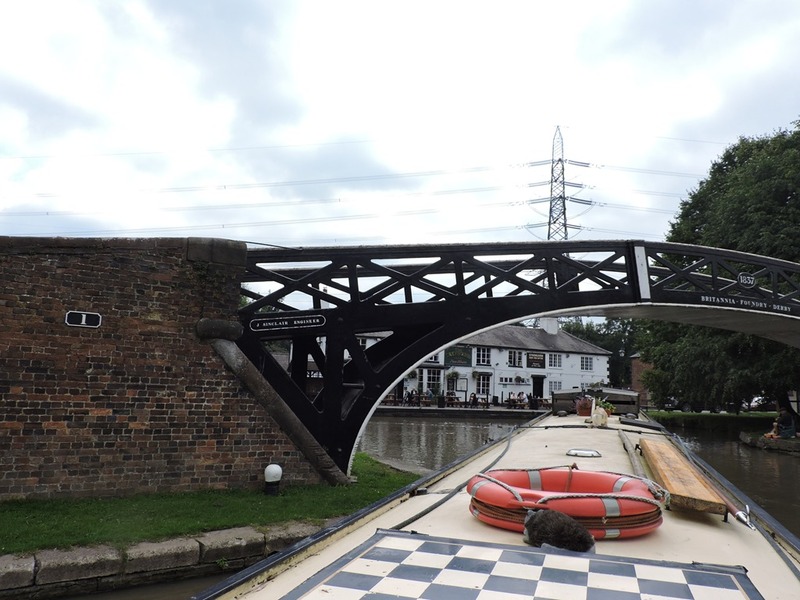 An hour later we were at Streethay Wharf, however, and an hour after that at Whittington Brook where the Coventry Canal (detached section) mysteriously changes into the Birmingham and Fazeley Canal with just a boundary stone to mark the change. 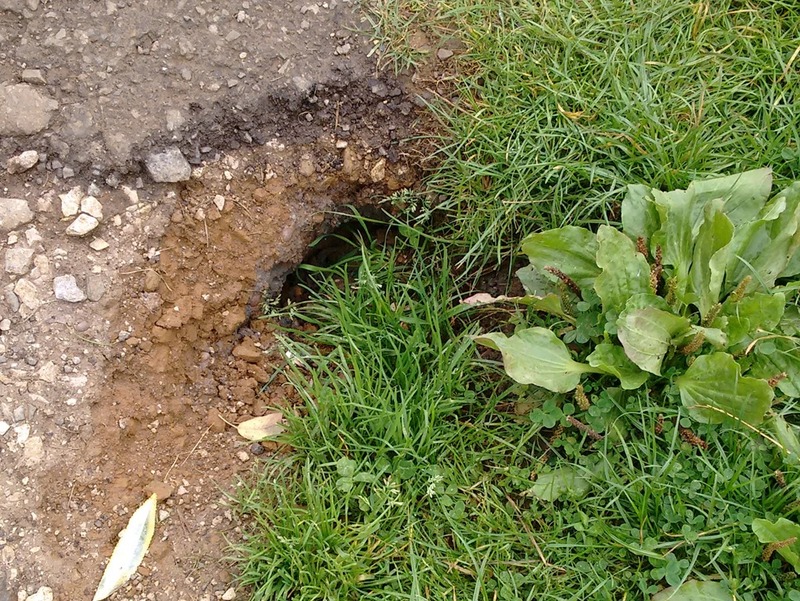 I’m sure there was once a good reason for this but it seemed to coincide with an improvement in the condition of the bank. 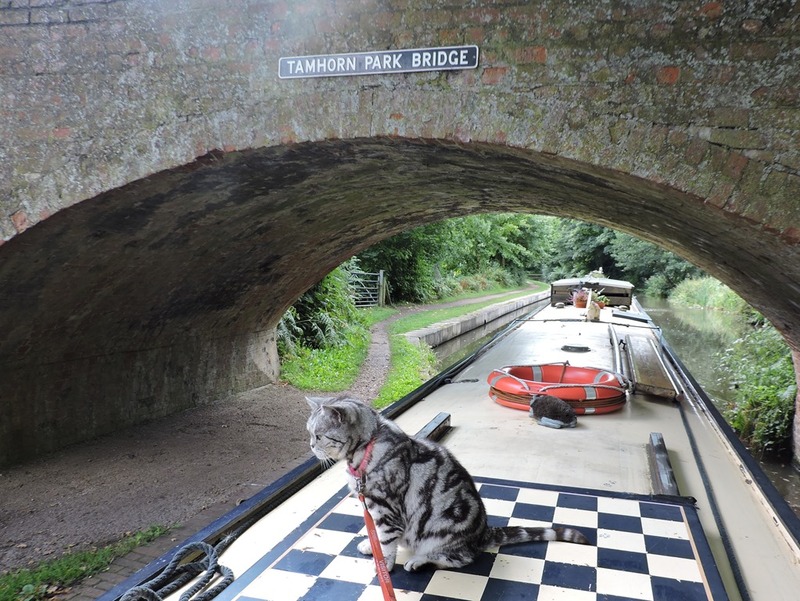 We passed Tamhorn Bridge where we think Catty jumped ship on the way up, so we made sure she was not able to repeat the trick. Through Hopwas Woods which has signs warning that it is a Military Firing Range and the village of Hopwas which has a pub either side of the canal. No stop here for us though, although we paused briefly at Fazeley Junction for cheese on toast as it was still a bit chilly. Keeping left at the junction we were under way again and back on the Coventry Canal (main line). Joy stayed inside to prepare tonight’s dinner and before she had finished we were at Glascote Locks. There was a queue and by the time it was our turn she was ready to bring the boat in. We helped a single-hander, who was following us, through as there was no hurry. 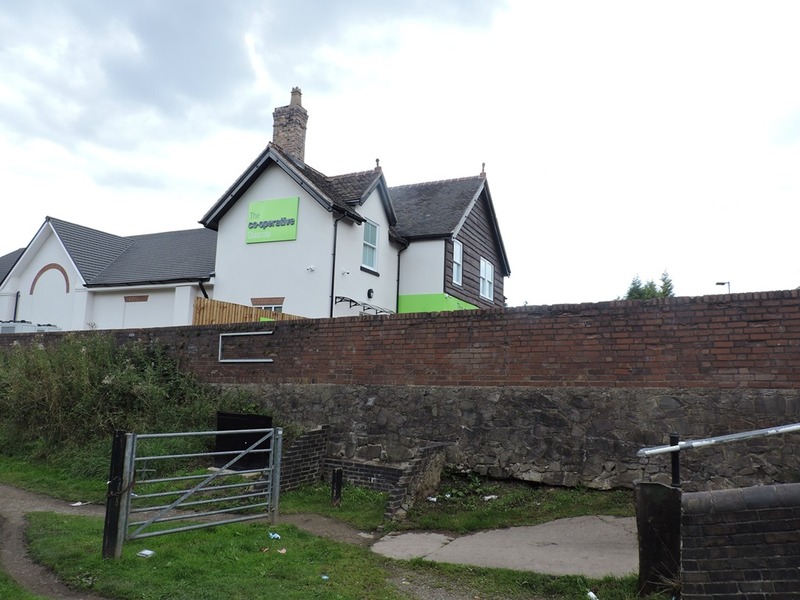 At the top of the locks was Anchor Bridge, but we found that The Anchor pub was there no more having been replaced by a new Co-op in the same style. See the story here in the Tamworth Herald. In just another half hour we reached our goal, The Gate Inn at Ammington. “What! Moored outside a pub again.” you say? Actually we moored on the towpath opposite but within a few minutes the boat on the pub mooring left and we snaffled their place. As we have visitors coming tomorrow this was ideal and as is the etiquette in these situations we patronised the establishment and were tempted by their 2 for 1 offer to stay for a meal. Joy enjoyed Plaice & Chips and it was Spinach & Mushroom Frittata for me, so Joy’s creation went into the freezer. The landlady also offered an electrical hook-up and water so we will be honour bound to have lunch there with our visitors tomorrow.